Today’s feast of Pentecost brings to an end the Easter Season, centered on the Death and Resurrection of Jesus. This Solemnity makes us recall and relive the effusion of the Holy Spirit on the Apostles and the others disciples, gathered in prayer with the Virgin Mary in the Cenacle (Cf. Acts 2:1-11). On that day, Christian holiness began, because the Holy Spirit is the source of holiness, which isn’t the privilege of a few, but the vocation of all. By Baptism, in fact, we are all called to take part in the in Christ’s divine life itself and, with Confirmation, to become His witnesses in the world. “The Holy Spirit pours holiness everywhere on the faithful holy people of God” (Apostolic Exhortation Gaudete et Exsultate, 6). “God wills to sanctify and save men, not individually and without any bond between them, but He wills to constitute them one people, which recognizes Him in keeping with truth and serves Him in holiness” (Dogmatic Constitution Lumen Gentium, 9). Through the ancient prophets, the Lord had already announced to the people His plan. Ezekiel: “I will put my spirit within you, and cause you to walk in my statutes and be careful to observe my ordinances. [. . . ] You shall be my people, and I will be your God” (36:27-28). The prophet Joel: “I will pour out my spirit on all flesh; your sons and daughters shall prophesy. [. . .] Even upon the menservants and maidservants in those days, I will pour out my spirit. [. . .] All who call upon the name of the Lord shall be delivered” (3:1-2.5). And all these prophesies are fulfilled in Jesus Christ, “Mediator and Guarantor of the everlasting effusion of the Spirit” (Roman Missal, Preface after the Ascension). And today is the feast of the effusion of the Spirit. Since that day of Pentecost, and until the end of time, this holiness, whose fullness is Christ, is given to all those that open themselves to the action of the Holy Spirit and make an effort to be docile to Him. It’s the Spirit that makes us experience full joy. In coming to us, the Holy Spirit overcomes aridity, opens hearts to hope, stimulates and fosters interior maturity in the relationship with God and with one’s neighbor. It’s what Saint Paul says to us: “The fruit of the Spirit is love, joy, peace, patience, kindness, goodness, faithfulness, gentleness, self-control” (Galatians 5:22). The Spirit does all this in us. Therefore, today we celebrate this richness that the Father gives us. Let us ask the Virgin Mary to obtain for the Church also today a renewed Pentecost, a renewed youthfulness, which gives us the joy to live and witness the Gospel and “to infuse in us an intense desire to be saints for the greater glory of God” (Gaudete et Exsultate, 177). Pentecost takes us to the heart of Jerusalem. Yesterday evening I was spiritually united to the Vigil of Prayer for Peace, which took place in that City, holy for Jews, Christians, and Muslims. And today we continue to invoke the Holy Spirit to arouse the will and gestures of dialogue and reconciliation in the Holy Land and in the whole of the Middle East. I wish to dedicate a particular remembrance to <our> beloved Venezuela. I pray that the Holy Spirit will give all the Venezuelan people — all, rulers <and> people — the wisdom to find the path of peace and unity. I also pray for the detainees who died yesterday. The event of Pentecost marks the origin of the Church’s universal mission. Therefore, published today was the Message for the forthcoming World Mission Day. And I also like to recall that, observed yesterday, was the 175 years of the birth of the Children’s Missionary Work, which witnesses children as protagonists of the mission, with prayer and with small daily gestures of love and service. I thank and encourage all children who take part in spreading the Gospel in the world. Thank you! My warm greeting goes to you, pilgrims from Italy and from different countries, in particular, the students of the Irabia-Izaga School of Pamplona, the group of the Saint Thomas School of Lisbon and the faithful of Neuss, Germany. I greet the Schola Cantorum of Vallo della Lucania, the faithful of Agnone and those of San Valentino in Abruzzo Citeriore, the Confirmation youngsters of San Cataldo, the “Giovani Amici” Social Cooperative of Terrassa Padovana and the “Catherine of Saint Rose” Scholastic Institute of Rome, which is celebrating its 150 years. And I wish you all a happy Sunday. And please, don’t forget to pray for me. Have a good lunch and goodbye! Names of New Cardinals Announced by Pope Francis at Regina Caeli. 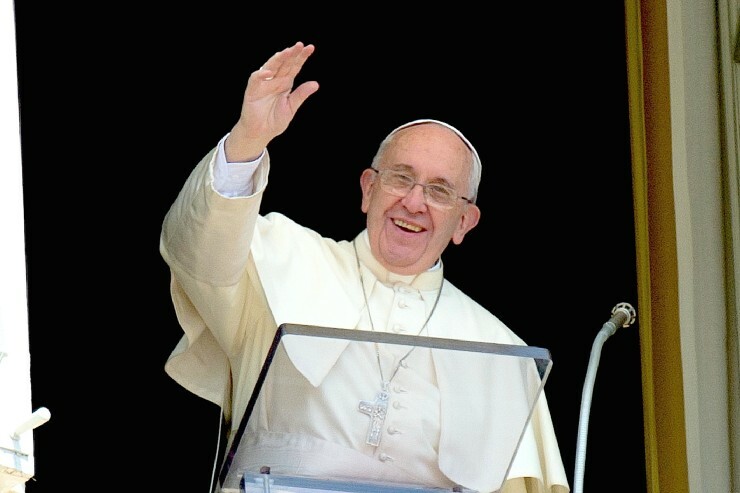 Pope Francis will create new cardinals at a Consistory on June 29th.